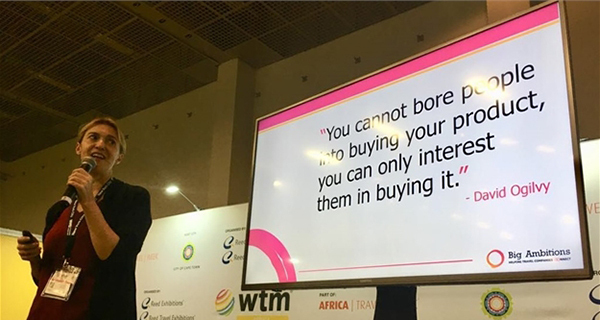 Natalia Rosa, Big Ambitions director of promotions, recently shared her insights into marketing for small tourism and travel companies at World Travel Market Africa. Although not having a marketing background herself, but knowing how to market really well, Rosa assured attendees that they could feel better about the fact that even though they’re not studied marketers, that they can still market their own small business successfully. You cannot bore people into buying your product, you can only interest them in buying it. Rosa says that although small businesses don’t necessarily come from a marketing background, or even when they do, they seem to think that the universe revolves around them, but it doesn’t. Rosa says that, as a small business owner, it’s important to look at your offering from the context of your customer, and not your own. What about your offering will entice a customer? Rosa says you need to figure why you’re special and what’s in it for the customer (what everything needs to revolve around), then you need to figure out what your brand promises. Introducing multi-channel marketing: Rosa then says that you need to try and figure out where people are getting their information from. Where do they find the information they need to make a decision on where to go, what to buy and with whom? “This is how marketing works – a once-off advert in a magazine will never help you, ever. If you going to advertise via print or online, you have to do it consistently, or else people will not remember you. “There are social media, there’s radio, there’s website, there’s paid search (PPC), there are catalogues, there are even newsletters – newsletters are the most powerful way of doing marketing, still.” If you have a database and you have a customer base, make sure to keep yourself top of mind, says Rosa, and try to get your customers to sign up for your newsletter so that they can become your best advocates and refer you. People want to be able to trust you – they’re fundamentally looking for that ‘expert status’, but how do you get people to see you as a thought leader in the industry? Rosa suggests that you begin to make it a habit to comment on articles in spaces that you know has a large following, such as Tourism Update for example. “You need to know what’s going on in your industry, you have to do the reading anyway. 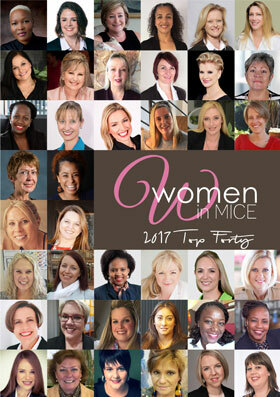 All you have to do is take that reading a step further and put your name out there: be brave and make a comment.” Rosa then shares how people on panel discussions don’t just become experts overnight – they become experts because they are willing to put themselves out there and comment on it all of the time. Building your brand’s credibility: Rosa says that joining an association should be at the top of your list of things to do – it would lend credibility and it would show that you are more than just a business. Also, registering your business on Google gives you a stamp of credibility as well (keeping in mind that your website looks super cool). “It doesn’t cost you a cent to do. It’s a bit tedious, but it works. So definitely get yourself a Google Business and then make sure that you have placement on your website – the things you have done before. In this way – if you still want to put packages together, or if you’re a tour guide or would like to provide some sort of experience – your customers get to tell your story, promoting you through posts on social media or giving you a testimonial that you can add to your brand.” Testimonials are a sure fire way to create the feeling of security for your customers. Rosa provides a few tactics to consider when working through your websites hub, also known as your ‘online home’ – that’s where you want people to come and visit you – and asks whether or not the tactics you are using are getting people to your website? Also, earned platforms – Are you partnering with influential bloggers who can promote your business (remember that they need to be paid)? And how are you managing your owned platforms – the things like your website, blog and newsletters? 2. Digital marketing: Travel and tourism is, unfortunately, a competitive space, says Rosa. She says that she wouldn’t necessarily make use of Google ads as big companies would outbid you all of the time and says that email marketing is the most powerful route you can take. Also, you need to make use of the right key words and long phrases when you’re looking to come out on top on of a Google search as Google regularly changes its algorithms. Backlinks are also an essential part of your marketing endeavours, but you need to make sure that you link to credible websites.